Vega Sicilia produces this 2003 Vega Sicilia Único ($465.96), a red wine from Ribera del Duero produced with tinto fino and cabernet sauvignon from the 2003 vintage and has an alcoholic strength of 14%. The 2003 Vega Sicilia Único is the ideal red to combine with foie and bar-b-q. According to Uvinum users, this red wine earns 4 out of 5 points while renowned wine experts rate it as follows: robert parker: 94 and peñín: 96. One of the most internationally prestigious wines could only have such a unique name, Único. Excellent, elegant, sober... It surprises and seduces in each and every vintage. Cherry red with garnet rim. Layer high and límpido.Complejo, deep and evocative aromas of black fruits, very interesting sense of sweet spices and herbs. Power elevada.Amplio aromatic, sweet, enveloping, excellent balance and good acidity. With fine tannins and a finish of great intensity, very persistent. A wine with a great life ahead. Fine aromas of violets. The truth is that I couldn't find any particular flavour, although I liked it. Reddish towards brown colour. Good oak smell. According to my personal opinion, it was quite flat on the palate. A wine with a high layer and a nice cherry colour. Cedarwood aromas. All Bodegas Vega Sicilia wines are quite balanced. 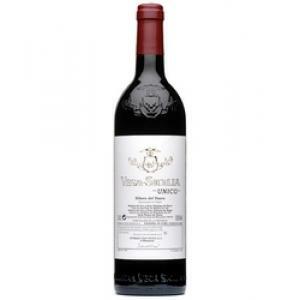 - View: 2003 Vega Sicilia Unico Gran Reserva is cherry red color with violet ruby. VEGA SICILIA UNICO is a unique wine, and one of the greatest Spanish classics. 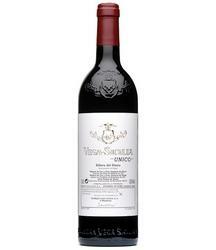 If you want to buy 2003 Vega Sicilia Único, at Uvinum you will find the best prices for Ribera del Duero red wine. Buy it right now at Uvinum, quick and 100% safe via any device. We bring you the largest catalog of more than 59.000 products becoming this way the biggest company to sell wine, beer, and spirits online in Europe with a community of more than 38.000 customers who enjoy Uvinum.